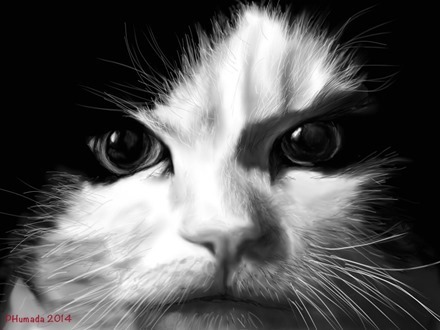 Today’s featured iPad art is this striking image with a perfect title – ‘I’m Watching You’. It’s an iPad painting by Pilar Humada, one of my favorite iPad artists. It still amazes me that Pilar only took up painting on the iPad less than a year ago. I’m much more of a dog guy, but we have a cat in our household too, and I think that even those who don’t own cats can appreciate the intensity of the stare in this image. You can see all of Pilar’s great work at her PHumada Flickr stream.